Love daisies? Wish they could last forever ? Love long lazy summer days and want them to last forever? This handmade felted bangle with individually hand stitched felt daisies is from my " please don't mow the lawn" series of inspired handmade goodies. Each flower is hand cut from felt and then hand stitched and beaded into place, quite a time consuming exercise to get them just right!. The bangle is handmade and handfelted from 100% wool. 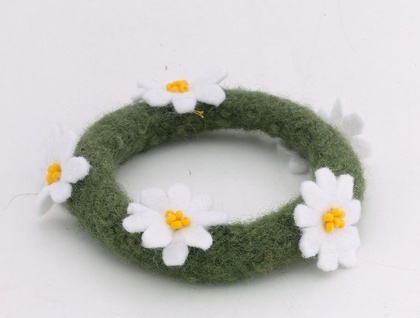 Felt flowers, beaded centres, 100% felted wool bangle.